Apple has filed two patents bringing liquid-cooling to increasingly powerful (and hot) laptop computers. Once the domain of massive number-crunchers, liquid-cooled notebooks foresee a day when quad-core processors and better video overwhelms current fan-driven cooling. In its U.S. Patent Office applications, the Cupertino, Calif.-based Apple outlined an active and passive liquid-cooling process. The active liquid-cooling process involves bathing circuits, the heat relieved via fins. A more inexpensive passive liquid-cooling procedure would include a heat sink located behind the laptop’s display. Moving the heat away from the computer’s body could solve the dilemma of an overheated lap. Although Apple is first to patent liquid-cooling for laptops, the method has been used in the past by other computer makers to dissipate the nearly 100 watts of heat produced by laptops. In 2007, HP unveiled a line of Voodoo laptops which used water instead of fans to cool the gaming machines. Hitachi and Toshiba have also investigated water-cooled portables. 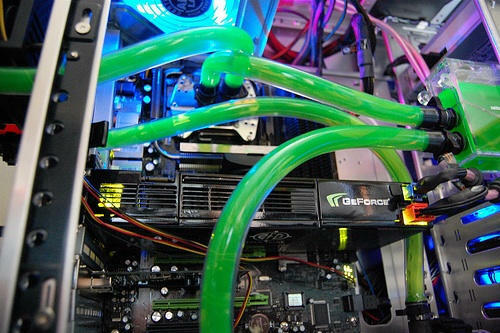 As some may remember, Apple had used a liquid cooling system in their tower computers a couple of years ago. Resembled the cooling system of a car’s engine and worked pretty well, as I recall. Used a radiator and fan arrangement , as I remember. They must have seen our site; http://www.powersystemscooling.com, we’ve already got the patents on this process, have products and are selling system and are filing an objection to this. A day late and a couple of Kw short Apple. Hey,nice post.Apple has raised the bar in design, and maybe they can raise the bar it notebooks running cool as well. If they are capable of doing that, then I myself may break down and jump on to a Mac.